There is no dearth of motorcycle enthusiasts in this world who dream of owning a thoroughbred MotoGP machine someday. Unfortunately, not many manufacturers sell their race bikes as they are not keen to make their various performance-enhancing technologies public. However, if you belong to the lucky bunch of incredibly rich motorcycle connoisseurs, Aprilia Racing has some good news for you. Aprilia Racing has introduced the RSV4 R FW-GP which is powered by an Aprilia V4 engine derived from the unit in the RS-GP 15. It has 81mm bore and pneumatic valve timing and guarantees maximum power of more than 250PS. It also gets Ohlins suspension, forged wheels, racing electrical system and ECU, Aprilia Racing instrumentation and an electronic gearbox with assisted downshift feature. 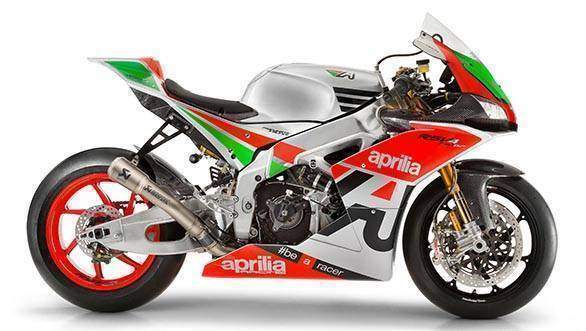 The Aprilia RSV4 R FW-GP is not road legal and will be exclusively for track use. Those who can afford to buy the RSV4 R FW-GP will receive some special treatment from the company. In an official press release, Aprilia Racing has said that "customers will be invited to their headquarters to stipulate the contract so that they can select the ideal configuration for their needs and budgets along with our engineers". While the motorcycle is being made, customers will receive pictures of the process and will also be allocated a telephone number to receive further information. Customers will also receive Aprilia Racing branded full track leathers as well as a paddock pass for an entire MotoGP weekend. That's not all, customers will also be invited for a special Aprilia track day. Engineers from Aprilia Racing will be around to alter the motorcycle settings depending on the owner's requirement and the circuit. They will also receive technical tips to extract the best performance from the RSV4 R FW-GP. Aprilia Racing is also offering three other performance versions of the RSV4 - the RSV4 R FW-SSTK1, RSV4 R FW-SSTK2 and the RSV4 R-FW SBK. Prices haven't been announced yet. For more details click here.